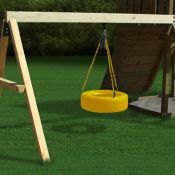 Our Tire Swing Beam Add on kits is perfect to add a Tire Swing to your playset, wooden swing set or fort. You select the color of the coated chains and tire. Complete 3D Plans with detailed Instructions, all the hardware to make a tire swing beam, residential lubricated Ball Tire Swivel and a Heavy Duty Commercial grade Tire swing will add much fun and excitement for your children. A Tire can accommodate two children comfortably and gives 360 degrees of tire swinging excitement or 360 degrees of dizzy spinning or Both! 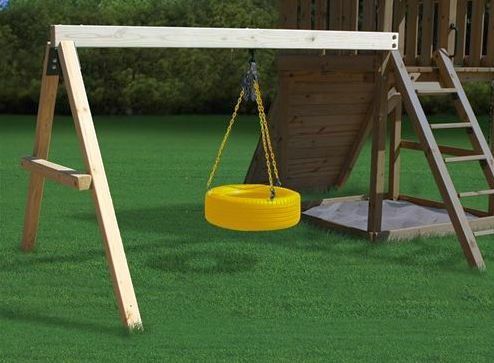 Adding a tire swing beam can actually get your kids to leave their technology, TV and Video games and go outside for some fresh air and exercise. It promotes better balance skills and provides enhanced muscular development. Zinc Horseshoe connect chain with tire.